Every project starts somewhere, inspired by some need, some desire for color, a picture in a book or magazine, a piece in a store window. My Mom tells the story of her grandmother seeing a crocheted doily in a shop window during the Depression, studying it, and then going home to recreate it. Inspiration! 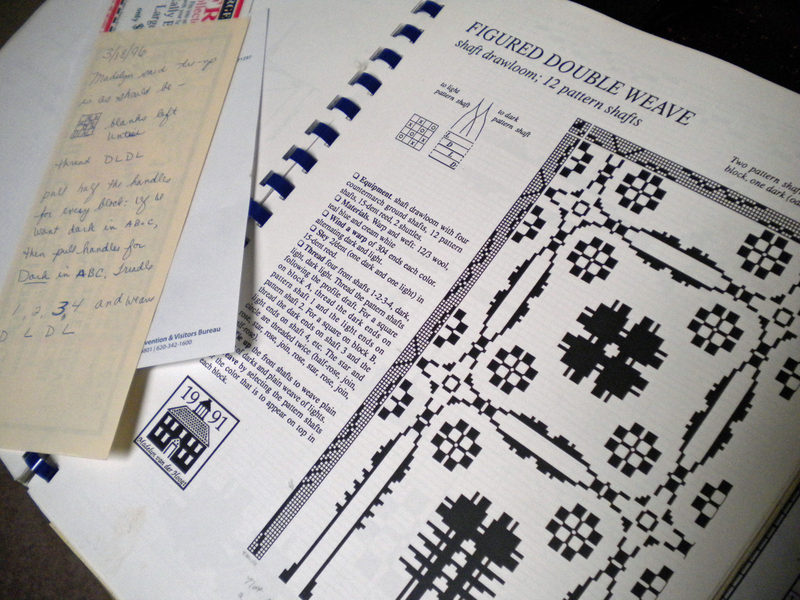 The inspiration for my block doubleweave goes back to a class at Madelyn Van der Hoogt’s Weavers School when it was still in Missouri. I pulled out my class notes and studied the draft. The blocks – the areas where the colors change – form a pine tree and snowball design, but what if I changed the order of those blocks? How would the overall design change? The easiest way to change a pattern is to treadle it differently, so I played around with the order of those blocks. Weaving the blocks in the same order as they are threaded, “as drawn in,” produces rings in the corners with ovals and diamonds in the center, like the green placemats. 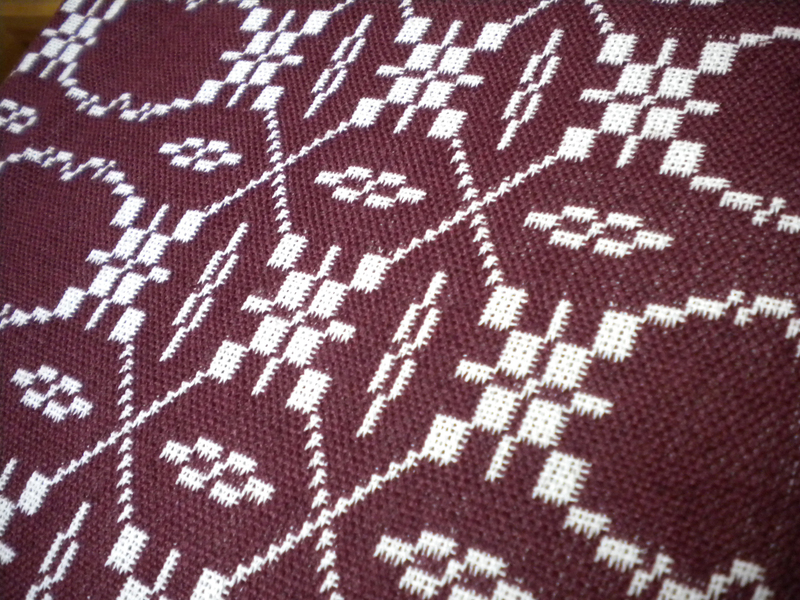 But I’m not a production weaver, so after weaving a couple placemats in this design, I started to ponder how to change it yet again without rethreading. Again, I looked at the block order. What if I treadled just one set of blocks over and over? How about treadling them in point order – back and forth, one repeat of each? There are so many possibilities. I have the second pattern on the loom now in a natural pattern against a deep wine background, and a third set will tie on after it in yet different colors. Three different designs with one threading, just by changing the block order! This is the evolution of design. 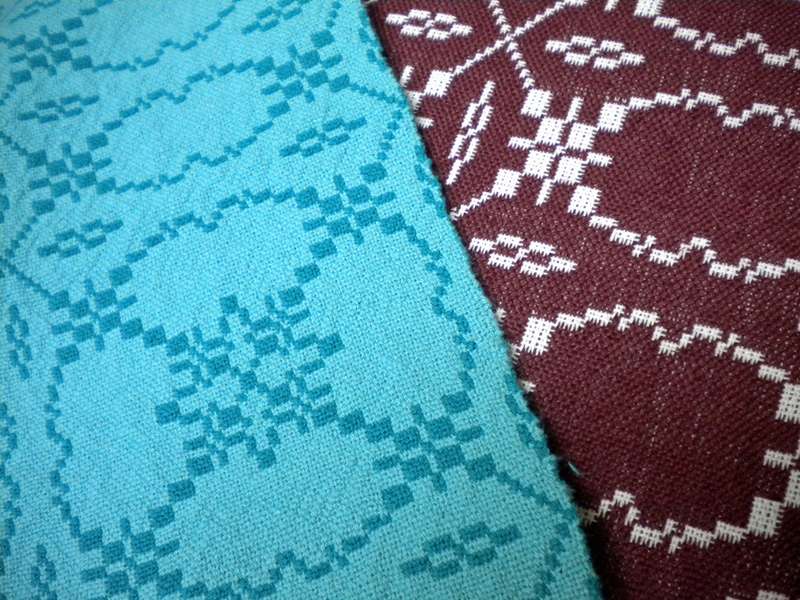 I do love this aspect of weaving–the different possibilities that are available on one warp! Dear me, though, I have so much to learn . . . .
Once one starts exploring the possibilites the paths one can take are endless. Exactly why I enjoy weaving.